Many who have traveled around South East Asia have heard about tubing on the Nam Song River, an activity that long-dominated the town and its visitors. Originally, the bars catering to tubers along the river were opened up by hedonistic backpackers. At one time, as many as 20 bars lined the river, with pulsating music, drinking games and drug-fueled debauchery becoming the norm. However, after 27 tourists died while partying on the river in 2011, the local authorities clamped down on drugs, shut down many of the tubing bars, put restrictions on the volume of bar's music, and removed riverside swings and "death slides." As of July 2015, five bars operate each day along the river on a two day rotation. However, those upstream bars still have a profound influence on the town itself, which has an atmosphere of lethargy by day and debauchery by night. In town, tourists sprawl out in the pillow-filled restaurants called "TV Bars," watching re-runs of US sitcoms "Friends" and "Family Guy" until the sun goes down, and then party heavily until the early hours. Free alcohol is served at many of the tourist-oriented bars in town, providing hours of free drinking for the frugal backpacker. Do not jump at all if you are drunk. It's very difficult to always predict where you will land in the water while jumping and there are almost always some rocks nearby! Please be a conscientious traveler not discarding your trash to pollute the environment. If you notice your fellow travelers attempting to discard their trash into the rivers and banks, give them the evil eye! 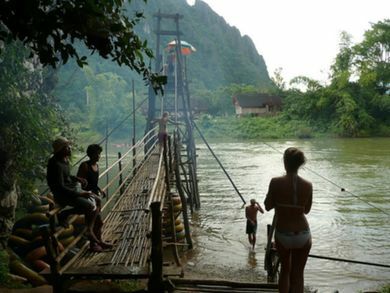 Note: As of 2015, the tubing and party scene in Vang Vieng is absolutely nothing like it used to be a few years ago, when there were literally thousands of drunk/high youngsters at the dozens of bars tubing on the river every single day. Those days are well and truly over. Now there are only 4 or 5 bars and a few hundred people a day tubing on the river. It is rumored that the Lao government stepped in because of all the deaths and injuries happening on the river that were highly publicized in western media newspapers. So they closed almost all the riverside bars overnight to prevent Laos' international image in Vang Vieng being damaged any further. Highway #13 is a two-lane road in fairly good condition except for a few bumps closer to the cities, nothing to worry about. The road between Vang Vieng and Luang Prabang is mountainous and boasts amazing scenery as well as worthwhile glimpses of Lao village life. 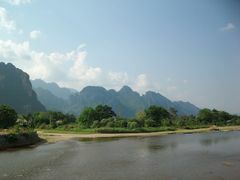 The road between Vang Vieng and Vientiane is flatter and less interesting. Buses from Vientiane cost about 50,000 kip (GBP4, €5, USD6). Minivans leave Vientiane all day and cost about 35,000-50,000 kip. The The Express VIP bus to Vientiane costs 70,000 kip (Sep 2016). Slower local buses to Vientiane without air conditioning run in the early morning (05:30-10:00) and cost about 40,000 kip for a 5 hour journey. The minivans and local buses leave Vientiane from the Northern Bus Station. The Northern Bus Station can be reached from the city by taking the number 8 bus, which can be flagged down along its route or can be caught at the Central Bus Station, downtown. The number 8 bus cost 5,000 kip as of September 2016. Southeast Asian 'crystal meth' is known as yabba and is available in both pill (red in color) and smokeable forms. Formerly legal in Thailand as a way for longhall truck drivers to keep awake. Yabba is an epidemic due to its highly addictive qualities. Manufactured locally, the drug can be cut with any number of substances. This page was last edited on 20 October 2018, at 23:30.